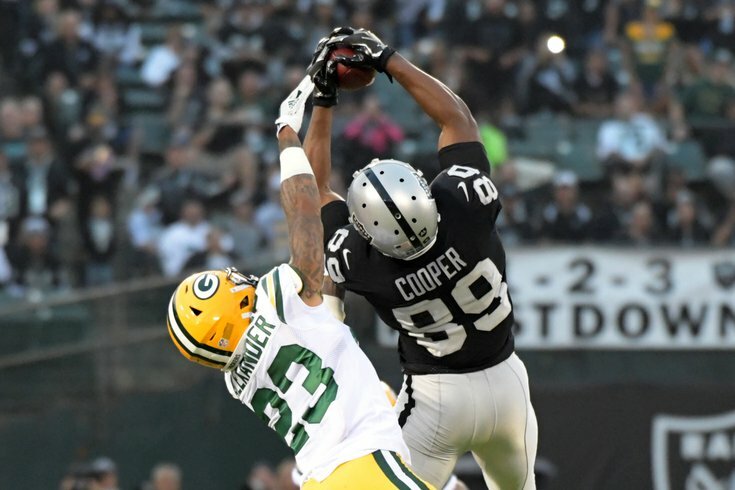 Oakland Raiders wide receiver Amari Cooper hauls in a catch in front of Green Bay Packers cornerback Jaire Alexander. The NFL trade deadline is now less than two weeks away, which is much closer than it even sounds, and the rumor mill seems to be working overtime compared to recent seasons — as typically it's the MLB and NBA deadlines that offer the most excitement. On Monday, our own Jimmy Kempski took a look at four areas of need on the Philadelphia Eagles that the team could look to upgrade before the deadline. So in today's trade-heavy edition of 'What They're Saying,' we're going to take a look at some of the latest NFL trade rumors and how they impact the Eagles, with a specific focus on the four positions Jimmy wrote about on Monday. It doesn't seem likely that the Bears would actually part with Howard -- he's on a rookie deal for another year after this one and complements Cohen -- but his role might be diminishing and he's not a great fit in the Bears offense with his lacking pass-catching skills. With the Eagles, he could fill a similar role that Jay Ajayi did before suffering a Torn ACL, as Corey Clement, Wendell Smallwood and Darren Sproles all can take on the pass-catching mantle. With Bell no longer reportedly planning on returning to the Steelers over their bye week, and McCoy likely staying put in Buffalo, it will be interesting to see what the Eagles do at running back — if they do anything at all. Two other names to keep an eye on? Raiders running back Marshawn Lynch and Cardinals back David Johnson. There have been reports that the Eagles have been interested in Johnson for a while now and with reports that Arizona is looking to blow it up and start over — hence the rumors surrounding All-Pro CB Patrick Peterson — now might be their best chance. The rumor has been out there for a while that the eagles are interested in Le'veon Bell.... but don't be surprised if they're also inquiring about Arizona RB David Johnson. As for Lynch, he's worth watching for similar reasons, which we'll get to in a minute. With Tim Jernigan out — and now Haloti Ngata missing time — the Eagles could certainly use some help at defensive tackle, but not because they don't have any talent there. They just lack depth. The addition of a defensive tackle who can stop the run and give you at least something as a pass rusher would give the Eagles (A) someone who can give Cox more of a rest so he doesn't wear out by season's end, while also (B) helping make opposing offensive lines pay when Cox is being given extra attention, whenever they're on the field together. It's pretty obvious to anyone watching the Eagles on a weekly basis that they currently lack the type of depth threat receiver that can not only take the top off a defense, but can also draw attention away from the underneath routes that guys like Zach Ertz and Nelson Agholor thrived on last season. And one of the names that popped up recently is Raiders wideout Amari Cooper. He and Oakland safety are reportedly being shopped by Jon Gruden. While Cooper, a former first-round pick, would be an obvious upgrade for the Eagles, it's going to be a matter of how much it costs, not just to acquire him, but also the $13.9 million option for next season, should the team want to keep him without signing him to a longterm deal. That, however, is where this could become problematic for the Eagles, as Will Brinson of CBSSports.com points out. Per Ian Rapoport of NFL Media, Gruden is even managing to blow things up with highly unrealistic expectations: Rapoport reports that Gruden and the Raiders are asking for a first-round pick for Cooper. "The other one that came out yesterday, Amari Cooper, which is something that would have been unthinkable a couple of weeks ago or certainly a couple of months ago. But the Raiders have had some conversations about potentially trading for him. My understanding is they've asked for a first-round pick in exchange for Amari Cooper, which is incredibly significant and which might make it difficult, if not impossible, to trade him." So it sounds like the Raiders WANT a first-round pick for Cooper, versus the Raiders hearing out offers involving a first-round pick for Cooper. Because it's pretty unlikely they're going to get that kind of a haul for Cooper, for several reasons. And, of course, there's no guarantee that Cooper would want to stay here long term. A first-round pick is an awful lot to give up, especially with his production dropping over the last two seasons. But maybe there's no need for the Eagles to look outside their own building. Just in the last 24 hours, there's been a lot of talk that Mike Wallace could be returning to the Eagles before too long. Considering that he was the guy brought in here to take over the Torrey Smith role from a year ago, that would help fix what's been ailing the Birds' passing game, at least for this season. Oh, and they could get Mack Hollins back too. Jimmy Kempski agrees, however he does mention the premium the Eagles would put on a receiver whose contract runs through next season, and Cooper (even if it's only a $13 million team option) seems to fit that bill. ... because there's more than one Raiders player he should be interested in. With the Raiders also shopping safety Karl Joseph, Roseman and the Eagles may have found the perfect trade partner in Gruden and the Raiders. At least that's what Dave Zangaro of NBC Sports Philadelphia recently wrote. Here's what he had to say about potentially trading for Joseph and why, while it appears to be the right move on the surface, adding secondary help may not be quite that simple. If the Birds bring in a safety, it would eventually allow Avonte Maddox to go back in the slot until Sidney Jones (hamstring) is healthy again. Jimmy Kempski agrees that the Eagles' secondary situation, with some guys already playing out of position, is already complicated and might not be an easy fix. The thinking here is that Jalen Mills and Ronald Darby will continue to start on the outside, with Mills kicking inside to the slot in nickel, and Rasul Douglas coming in to play on the outside. That's a decent enough emergency solution for now, but what if the Eagles suffer even more injuries? The acquisition of a safety who can play deep middle would solve a lot of problems.